Air Jordan 5 lovers will have another thing to be excited about this year with the release of the highly-anticipated “Grape” edition of the kick, which will return to the market this year. 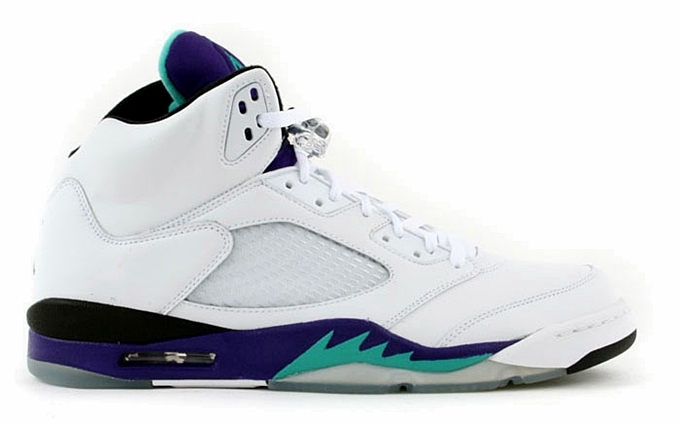 This edition of the Air Jordan 5 retro, which features white leather upper accented with blend of purple and green hints along with an Icy Blue sole, will hit the market on May 4, 2013 with its retail price set at $160 per pair. This edition of the kick, which is officially listed as the White / New Emerald – Grape – Ice Blue colorway of the model, will be released for the third time in Jordan Brand history – first in 1990 and second in 2006. This is absolutely something to watch out for so make sure to put this kick on top of your priority list.